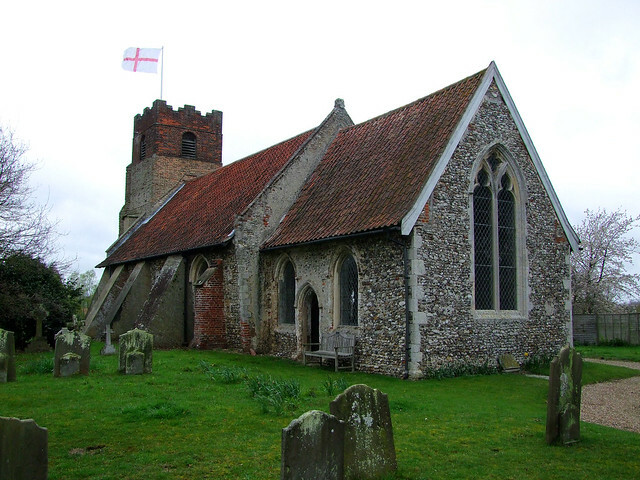 This church faces its gloomy neighbour, Stratford St Andrew, across the valley of the River Alde; although here, it is more the valley of the A12. St Mary is a hilltop church, suggestive of an ancient site. There was a Roman encampment here, hundreds of years before the first church. It would be a natural location for either, and also for a pagan temple, which may well also have existed here. The quiet lane climbs away very quickly from the main road; the sound of it is soon lost to the wind. Farnham, like Stratford St Andrew and Little Glemham, is split apart by the horrible A12, and a bypass is unlikely in the near future. If they ever get one, the houses here will double in value overnight. The trim little church sits in its trim little churchyard, with the village below it. It is easy to imagine a lonely Roman guard looking out over Pye Street, which ran from Colchester to Caistor up the valley below. Above you, the tower is quite unusual, in that it is mainly built out of thin white bricks. The top part is red, and there is a great deal of repair work on it. These white bricks have also been used to outline some windows and a door. Mortlock thought this had been done in the late 15th century. The path from the east takes you to the north side, and as the building unfolds before you, its great age becomes increasingly apparent. You step through the north door into what is clearly a Norman nave - note the lancet windows, and look at the thickness of the walls! The windows are widely splayed, and the south wall leans outwards. As at Cotton, this is rather attractive, but it has caused great problems. The window opposite the entrance was obviously once a south door, and this will be more apparent from the outside. A holy water stoup is still set in the wall beside it. This doorway was blocked up quite recently, as we shall see. The interior of the church is very pleasant, and the brick floor is beautiful. The box pews are plain and simple 18th century affairs, and the roofs (19th century in the nave, earlier in the chancel) are also plain and simple. Some panels from the old rood screen are mounted on the west wall. The general air is of a well-kept, well-ordered simplicity. This lovely little church is such a contrast with Stratford St Andrew across the valley. You step outside, and head around to the south side. Here, you'll see immediately how drastic the structural problems have been. The doorway was blocked up to strengthen the wall in the south west corner, and the wall has four mighty brick buttresses supporting it, faced in concrete. One of them partly covers a blocked window. They are not wholly ugly, but they are rather unattractive. Rather uncompromising too, and out of keeping with the general air of simplicity. It would be good if some climbing plant could be encouraged to cover them. In fact, you could probably grow vines on this south-facing slope. Now, there's a Roman solution to the problem.